William Moss, a Liverpool surgeon, wrote a guide to Liverpool with the object of ventilating matters 'needing attention' and mentions that the poorest people live overcrowded in cellars, intemperate in habits and neglectful of their children. The expectation of life in Liverpool in the early nineteenth century was less than in most other places. That what to us ye give-to God you lend. 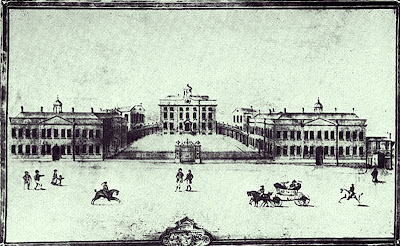 Medical Library on the extreme right, c.1813. 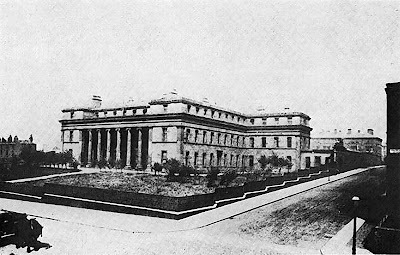 The first Infirmary stood on the site of the present day St George's Hall, and cost £2,600 to build. It was expanded in 1771. The Infirmary paid dividends even though it only contained fifty-four beds. It represented a splendid act of charity on behalf of the citizens, but it was also a necessity because ship-owners and others supported it to serve the needs of their servants, sailors and dependants. In addition there was a Seaman's Hospital, or rather hospice, under separate management, to care for sailors and their families. The old Infirmary was replaced in 1824 by a new hospital and lunatic asylum and was built on Brownlow Street and renamed the Liverpool Royal Infirmary in 1851. The old Infirmary was closed in 1826 and eventually demolished in 1842 to make way for St George's Hall. The one on Brownlow Hill was designed by John Foster 'It was not his most inspired offering, its portico, six fluted columns in dry, classical style pinioned by plastered antae, had a certain monumental dignity'. This in turn gave way in 1887 to the present Gothic building designed by Alfred Waterhouse. The original building did not please everyone including John Aitken, one of its surgeons, who considered that the wards were dangerous owing to overcrowding, but the trustees had reason to be thankful because all debts had been paid off by 1752 and for the time being Liverpool's problems were solved. By a curious chance it was the slave trade that initiated medical education in Liverpool and this was done by men known as 'the African Surgeons'. In the eighteenth century medical qualifications were variable, so that it was necessary for candidates for surgical appointments in the Navy to submit to the examining board of the Company of Surgeons in London. An Act of Parliament was passed in 1789 compelling owners to carry a surgeon in each ship. To select suitable men a licensing board was set up in Liverpool and it examined 634 surgeons between the years 1789 and 1807 rejecting no less than 151. The examinations were held at the Infirmary monthly as required, successful candidates paying a fee of 3 guineas with 5s.0d. for the secretary. Unsuccessful candidates paid 5s. 0d. only to the secretary. Additional fees were levied if special examinations had to be arranged. The following members of the Infirmary staff served on the board-Joseph Brandreth, James Currie, James Gerard, Henry Park, John Lyon and Edward Alanson. The Infirmary was taking pupils by permission of the Trustees although the first recorded payment was in 1802. An improved education was becoming necessary so that, as in London and other towns, anatomy schools were founded to enable pupils of local doctors and the Infirmary pupils to obtain a better preliminary training. Gill's and Formby's Schools are mentioned in the Report from the Select Committee in Anatomy (1828). There were about forty students, including sculptors, painters and others besides medical students, studying at two schools, one in the charge of Richard Formby and the other founded by William Gill, later surgeon to the Northern Hospital. According to Dyce Duckworth, Formby never had a large practice nor was he a favorite with his brethren but was of independent means and mainly interested in teaching. He had been a pupil at the Infirmary before going up to Cambridge in 1808. Prior to the Anatomy Act there were scandals due to the activity of the resurrectionists. Resurrectionists were commonly employed by anatomists in the United Kingdom during the 18th and 19th centuries to exhume the bodies of the recently dead. Between 1506 and 1752 only a very few cadavers were available each year for anatomical research. The supply was increased when, in an attempt to intensify the deterrent effect of the death penalty, Parliament passed the Murder Act 1752. By allowing judges to substitute the public display of executed criminals with dissection (a fate generally viewed with horror), the new law significantly increased the number of bodies anatomists could legally access. At one time bodies destined for Edinburgh, were shipped to Liverpool from Dublin. William Gill was implicated in resurrectionist activity; the body of a young woman buried in Walton was found in the cellar of a house which he owned in Seel Street. Gill was very fortunate to be discharged by the magistrates. The schools required 24-28 bodies annually, costing 3-7 guineas each. Church Street in 1798, showing the Dispensary from 1782 to 1829. Bodies were more easily procured from Dublin and they cost from 3-5 guineas each, but they were liable to seizure by customs officials. 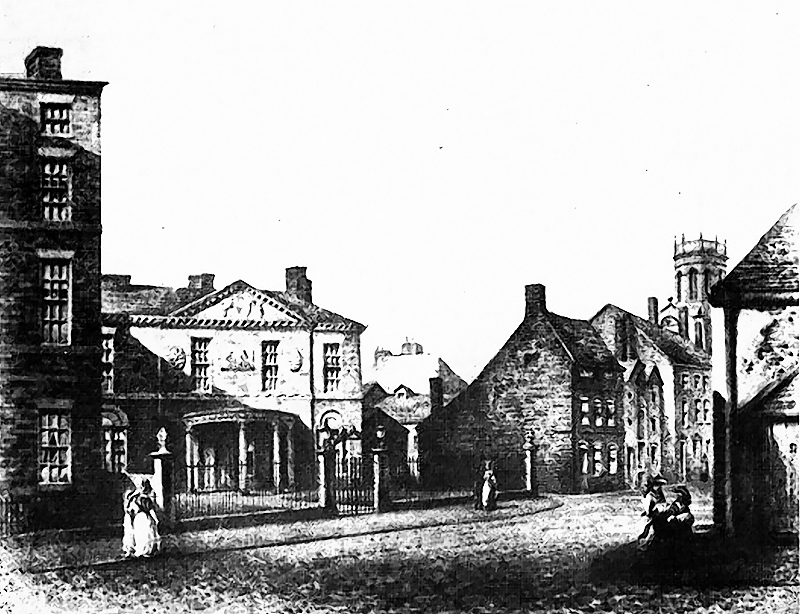 From as early as 1811, lectures were given at the Liverpool Dispensary, which had been built in Church Street in 1778. Sir Zachary Cope has pointed out that the Free Dispensaries played a considerable part in medical education in Britain. 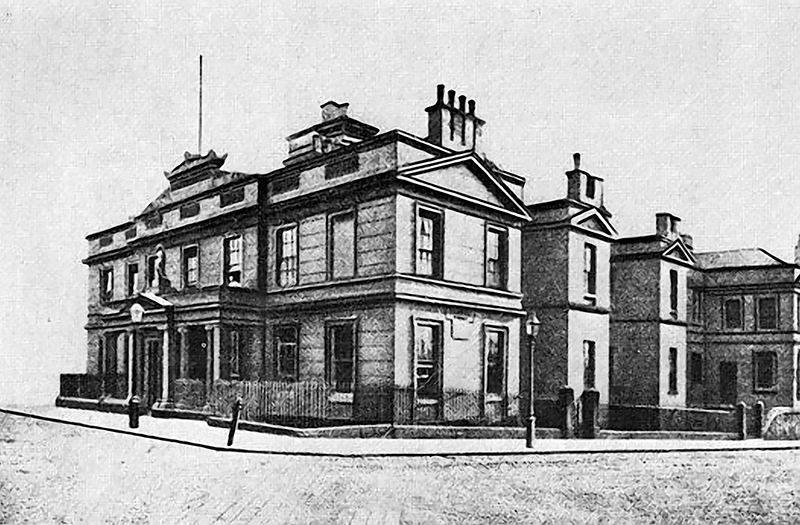 Later the lectures were given in the Royal Institution in Colquitt Street. In 1833, the physicians and surgeons of the Dispensary required beds so that there was an agitation to found a new hospital, made necessary because the Infirmary could no longer cope with the vastly increasing population, particularly at the north end of the town. The result was the founding of the Northern Hospital notably supported by the reformed Council and men like Dr. James Carson, described as 'an old practitioner of the town'; William Brown, later Sir William, and a distinguished Chairman of the Northern, was also involved. 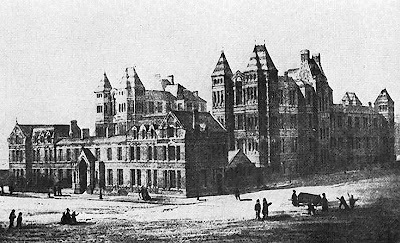 The Northern Hospital, Great Howard Street, 1845-1900. 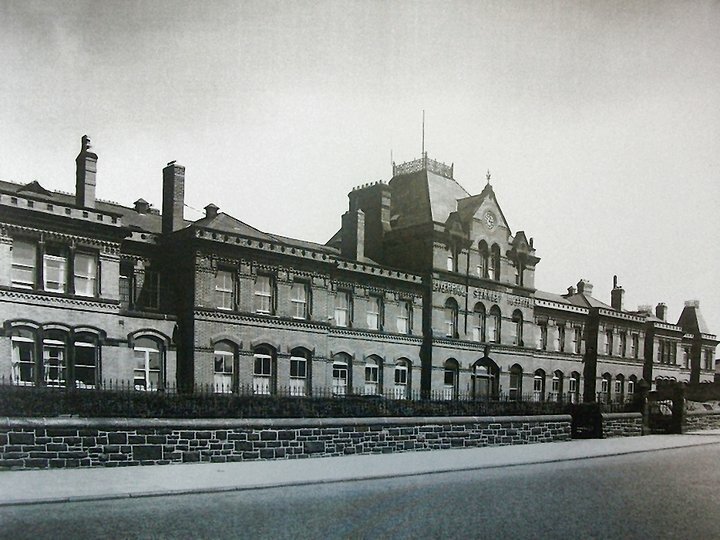 The David Lewis-Northern Hospital, Great Howard Street, 1900. At a much later date, the Northern became the first hospital in Europe to have its own ambulance, originated by Reginald Harrison, one of Britain's first urological surgeons, who wrote many pamphlets in its support. It cost £227 a year to run and it cost the hospital more to hire the horse than to pay its driver. 'The average time of each journey from call to return was 18 minutes 30 seconds' according to Harrison. A houseman or a student had the duty of accompanying the driver and the ambulance was equipped with drugs, splints, instruments (including a tracheotomy tube) and dressings, so that the patient had intensive care from door to door. Of course, prior to this patients were transported in a litter; but it should be said that if you lived in Glasgow you could be taken to hospital in a sedan chair, provided by the Royal Infirmary in 1794. 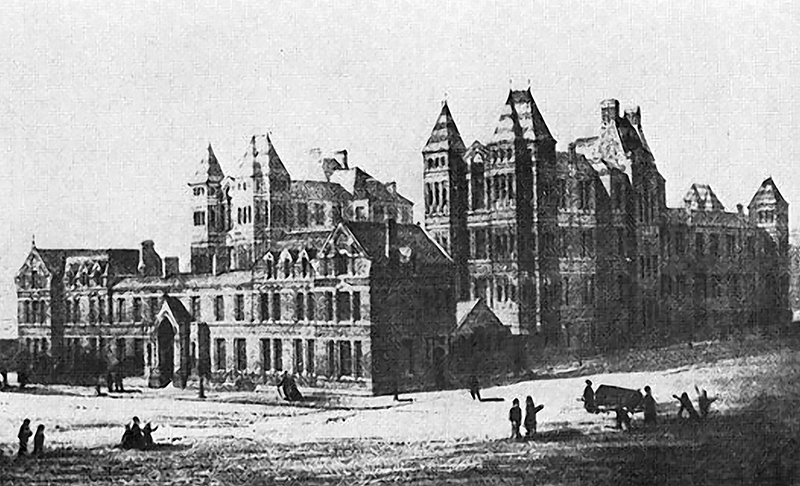 The Southern and Toxteth Hospital, Greenland Street, 1842-1872. 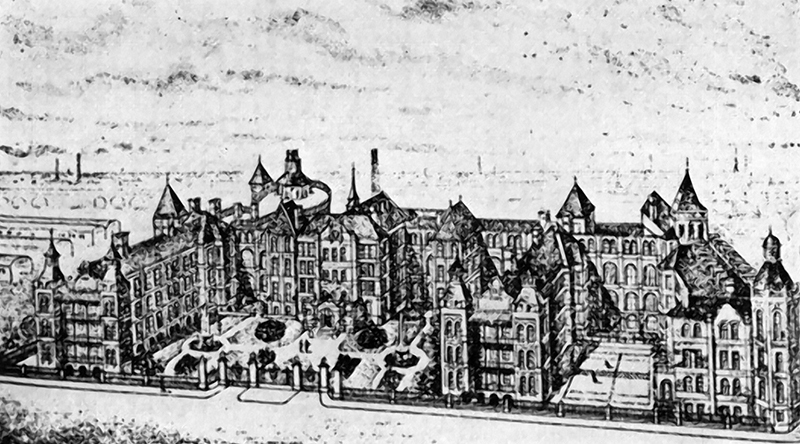 In 1842 it was necessary to build yet another hospital which became the Royal Southern Hospital caring for the needs of the South end of the town. It moved to a new building in 1872 and was recognized as a teaching hospital by the Royal College of Surgeons in 1857 and by the Society of Apothecaries in 1870, because it then had two physicians, which were required by rule. In 1867 the city had again extended north into Kirkdale leading to the establishment of the Stanley hospital. 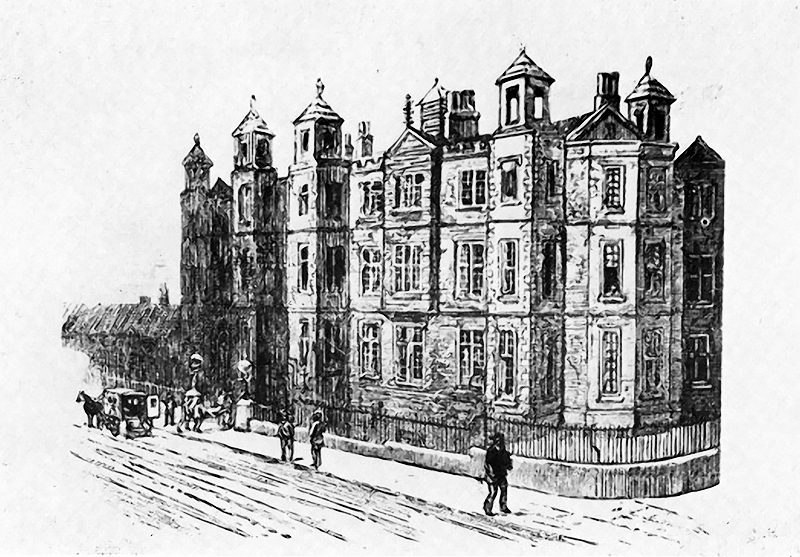 It is not by coincidence that the university backs on to Dover Street, because it started simply as an extension of the Medical School and was built on the site of the Lunatic Asylum which had followed the Infirmary up Brownlow hill in 1830. 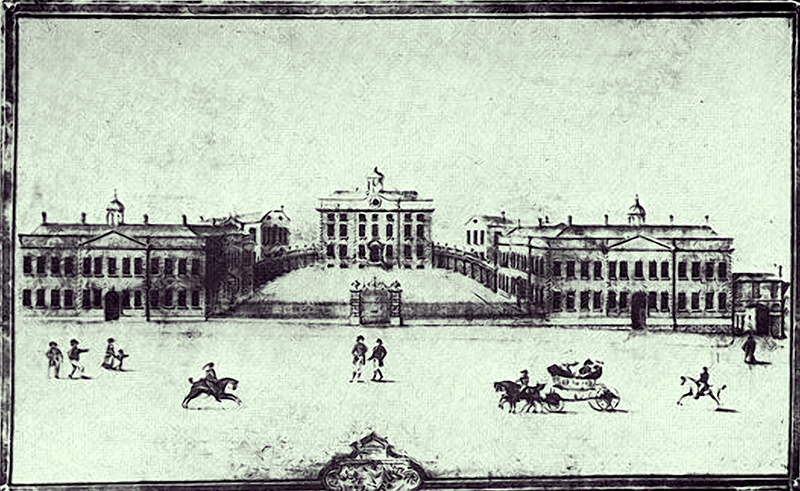 The beginnings of the university can be traced back to 1876 when the Medical School, owing to changes in the regulations of London University, required a lecturer in physics, so they appealed to the public for funds to start endowments, a reasonable request considering the great public service which it was rendering. It is interesting to note that Dr. James Carson as early as 1836 urged the town council to found a university. A joint committee with prominent local people decided to discuss with the Corporation the formation of a university college. A chair of physics was endowed in 1880 and the college received its charter in the following year. Combining with the Leeds and Manchester colleges to form the Victoria University, it was possible to grant degrees. 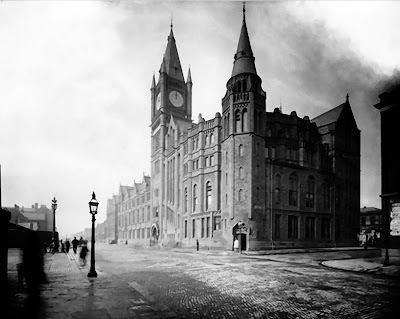 The University of Liverpool was granted its' own charter in 1903. During all these years new departments were built and new chairs endowed in medical and pre-medical subjects. It is significant that the Statutes of the University make research obligatory. Towards the turn of the century new minds, cultivated by the considerable advances of mid-Victorian days, brought new ideas and a modern outlook for the millennium. 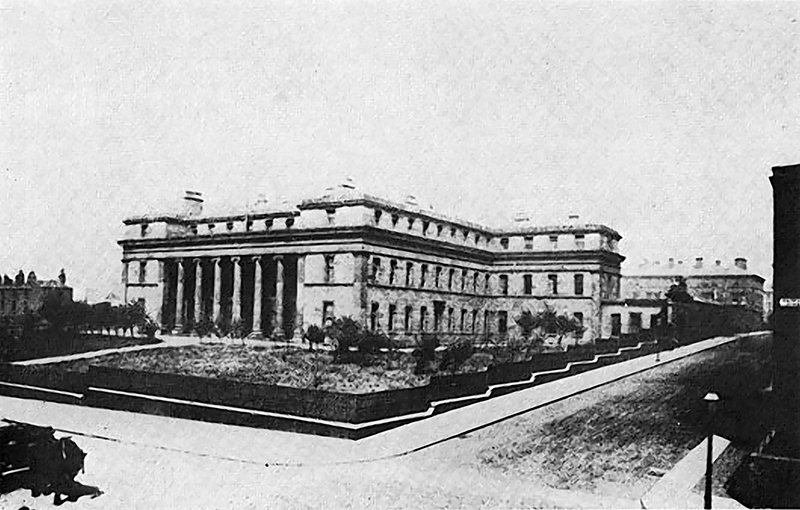 The Northern, Southern, Eye and Ear Infirmary and the Women's Hospital were all recognised by the university and the conjoint boards in London and Scotland. K. W.Monsarrat, a distinguished surgeon and teacher, persuaded these hospitals to combine to form a Clinical School, which later in 1907 combined with the University Clinical School, thereby considerably widening the basis of clinical teaching and providing new scope. BICKERTON, T. H., A Medical History of Liverpool, London, 1936. CoPE, Z., 'The influence of the free dispensary in medical education in Britain', Med. Hist.